Minecraft 1.4.2 Not Enough Items Mod is relatively similar to the Minecraft Too Many Items mod. It brings more options to the Minecraft and you can have the luxury to use more options rather than the traditional Minecraft options. 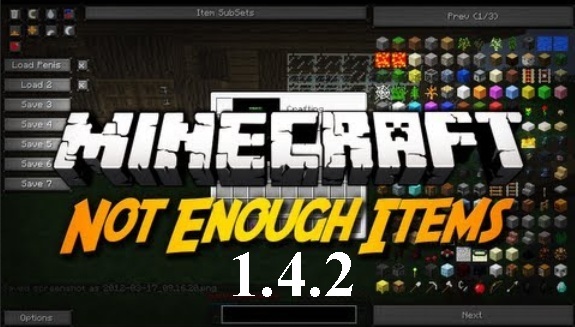 Minecraft Not Enough Items mod for 1.4.2 version is now available on internet. So check the rest of the details below. Description: A custom tool Inventory management modification for Minecraft 1.4.2. All types of Mob Spawners obtainable and place able. – Download & Install Minecraft Forge. – Now download both CodeChickenCore and Not Enough Items mod jar files. – Press WinKey+R > Type %appdata%/.minecraft/bin folder and open Minecraft.jar using WinRAR. – Drag and drop both ChodeChickenCore and NEI jar files in coremods folder. • NEI is not compatible with TMI mod, your Minecraft will give issues if you try to install them. • You must have ModLoader or Minecraft Forge API to install this mod. • Create a back-up of your World Saves just in case. • Compatible with Mo Creatures 1.4.2. • MobSpawner will not work without Forge. So guys have fun playing Minecraft with Not Enough Items Mod for 1.4.2 version. Keep coming here to check the latest updates of your favorite game online here.